 What if we don’t hit a unique solution?  How do we transform the average behavior into a robust method with provable correctness guarantees? Somewhat surprisingly, all these issues can be resolved!  In practice, we use relatively short XORs  Issue: Higher variation  Good news: lower bound correctness guarantees still hold  Better news: can get surprisingly good results in practice with extremely short XORs! How Good are the Bounds?  In theory, with enough computational resources, can provably get as close to the exact counts as desired.  In practice, limited to relatively short XORs. However, can still get quite close to the exact counts! MBound xor size lowerbound . 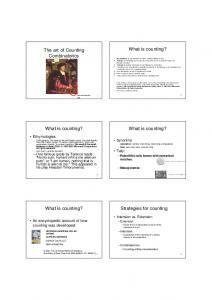 Report "Model Counting: A New Strategy for Obtaining Good Bounds"